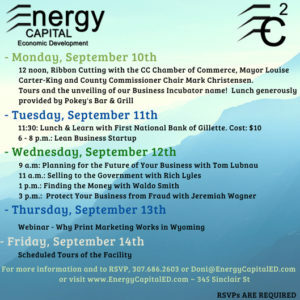 You are invited to the Energy Capital Enterprise Center Grand Opening events the week of Sept. 10. The week will kick off with a ribbon cutting at noon on Monday, Sept. 10, and will include several other events, including tours and learning opportunities. Ben Connolly and Cody Friedlan with First National Bank of Gillette will visit with attendees on what banks look at when financing small businesses. Cost is $10 and includes a light lunch. Thinking about starting your own business? Prepare for the challenge by attending this FREE presentation. “SYOB” is designed to help potential business owners explore the pros and cons of owning a business and evaluate the skills and knowledge necessary for success. We will cover topics such as how to develop a business model from your idea, the truth about start-up capital, business legal structures to consider, and more. If you plan on joining Wyoming’s small business community, “Start Your Own Business” is a basic introduction to this exciting and challenging world. One of the biggest and most difficult issues your children and employees may have to deal with is: How to retain YOUR business and YOUR good customers after you leave your business. Your departure might be retirement, a catastrophic illness or even death. Gillette Lawyer, Tom Lubnau, has seen it all and would rather help YOU now rather than later. Tom will introduce you to the “why” and “how” of planning ahead. The Government doesn’t make anything; the Governments in the United States spend several Trillion dollars a year in goods and services. From paper to flag poles, and everything in-between, local businesses have a chance to sell goods and services to any branch of Government. Rich Lyles travels across Wyoming helping small business navigate the process of selling goods and services to Government entities. Maybe you have something “the Government” would buy. Learn what the Government buys, and business opportunities, from Rich. Fraud can devastate a business in the blink of an eye. Learn about the threats from outside a business as well as the problems that can develop right under your nose. Detective Jeremiah Wagner, a 10 year veteran of the Gillette Police force, is a detective with some stories to tell, and way to prevent threats. Lean to identify the red flags of fraud.